We’d love your help. 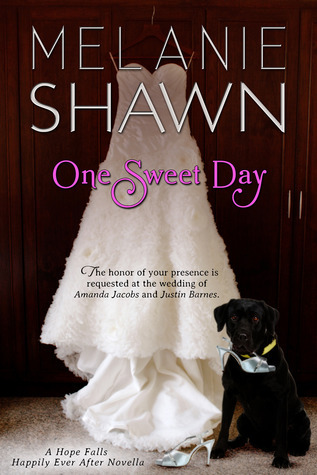 Let us know what’s wrong with this preview of One Sweet Day by Melanie Shawn. The honor of your presence is requested at the wedding of Amanda Jacobs and Justin Barnes. Catch up with the "Fabulous Four" as all the girls come together to celebrate Amanda & Justin's big day! To ask other readers questions about One Sweet Day, please sign up. I honestly love this series and all the characters - this little novella is sooo cute and a total must read if youre a fan of the Hope Falls characters. We get to see the first couples wedding (Amanda and Justin) and get a glimpse of the new couple to be... and of course we see the amazing bond these friends share! Cant wait to read more! I honestly love this series and all the characters - this little novella is sooo cute and a total must read if you´re a fan of the Hope Falls characters. We get to see the first couple´s wedding (Amanda and Justin) and get a glimpse of the new couple to be... and of course we see the amazing bond these friends share! Sweet, cute, quick, and typical Justin and Amanda. Grab this one for a lazy afternoon of reading in the hammock and join all of Hope Falls as they pull together to give their hometown sweethearts the wedding of their dreams. The Fabulous Four...There's nothing they can't accomplish!!! Well written story for Justin & Amanda's big day and having the fabulous four get together again! There was even a nice surprise visitor to the mix in the book! The Fab Four and friends make Amanda & Justin's big day even more memorable! Also a good introduction for Snow Angel, the next installment in The Hope Falls Chronicles series with Lily & Eric's characters making an appearance! Definitely a Happy-Ever-After story....which is good reading with happy end for all. You are cordially invited to the wedding of the century. Or it would be if the wedding planner hadn't stolen the money and left Amanda and Justin in a bind 2 days before the wedding. What's a bride to do? Call on her best buddies of course! Seriously, the little scene in Justin's car might be the cutest thing ever! Short read that gives you more in The Justin and Amanda story. After reading a recent Hope Fall's series book I noticed that I hadn't read One Sweet Day yet. I really enjoyed Amanda's story, and the rest of the Fabulous Four, so I was excited to see Amanda get married. Unfortunately this novella just didn't work for me. This is the story of Amanda and Justin's wedding. All the girls come in for the event and I thought it would be fun to catch up with them all again. The writing in this was just not that good. Really I was reading it thinking did I really like those other books? Were they really better than this was? The girls, their conversations and interactions, were all so stiff and almost robotic. It did not read like a couple of friends talking. It was too stilted for that. After a while I did go back and read part of Amanda's story again to see if it was the same stiff conversations. It wasn't. In her story it did read like a bunch of friends who hadn't seen each other in a while were just catching up. I'm not sure why this novella was so different writing wise, but it didn't work for me. As much as I wanted to be enjoying the story I just couldn't. The wedding itself was nice, but getting there didn't wasn't much fun to read. Little longer than a short story. I usually don't bother with stories this short but it was part of a box set. It was cute. It was sweet. Even as a slow reader I finished it in one day. (that includes working 9 hours too). The story could have easily been incorporated into another book and just been a side story. At least half was rehashing the first 4 books. It's finally time for Justin and Amanda to make it official. Problems come up two days before the wedding that could cancel it all. They need a miracle. Read how their friends pitch I n to help out. Review to come... Just read EVERYTHING this author wrote non-stop! I always cry at weddings........ this was no exception. my only criticism would be the times the editor missed Jason instead of Justin, along with missed punctuation. sweet story to finally have Amanda and Justin's wedding. I really enjoyed reading it. This is a short sweet story but a little hokey. It was a nice catch up on all the characters we love in the town of Hope Falls. And of course FINALLY Amanda & Justin's wedding! Love this series! Can't wait to read more!! This was such a cute little story. I loved reading about Amanda and Justin's wedding. I loved all the stories in this series. Thank you for your stories. Keep them coming.